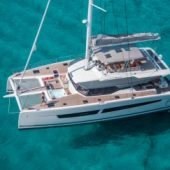 All Fountaine Pajot team is glad about the Cottier family who owns a SALINA 48, Libellule, for the unprecedented feat they accomplished. 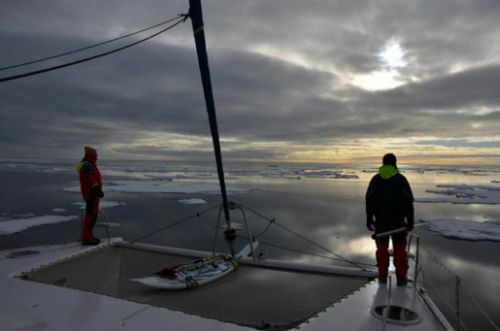 It is indeed a record : This is the first time that a cruising catamaran crossed the Northwest Passage, and it’s also one of the first families who made it with children. 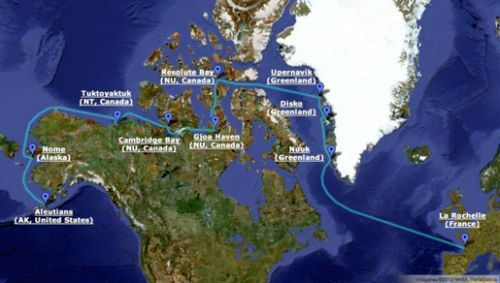 „After 2 months and 7,500 km sailing on Roald Amundsen’s tracks from Nuuk/Greenland to Nome/Alaska, we now go back to a different life. No more icebergs, strong winds, fog, no more cold, lack of sleep, no more adrenaline rushes searching our way through dense pack ice, no more wild arctic landscapes and fantastic wildlife! A lot of people were skeptical of our success chances when we started out, as glassfiber catamarans are not ‘a priori’ built for the ice. 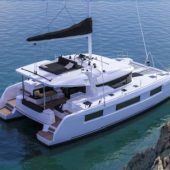 However, catamarans also have a few advantages, such as being faster; having less draft which gives more safety margins in shallow grounds and anchorages; such as having two engines and two rudders so if one breaks we can still use the other one; plus significantly more space. And with the modifications we made to the boat (Kevlar around the crash boxes and the sidelines of the hulls, reinforced rudder shafts) Libellule actually did very well in the pack ice. We managed to push ice floes away, go on top of some floes, and felt reasonably protected against crashing into floes and bergy bits. And with our Inmarsat Fleet satellite communication system, we had «the best ice charts in the Arctic» (quote Tooluka), meaning we could always download the latest weather and ice information from the internet, which helped us a great deal. In the end, we were the second sailboat to arrive at the other end of the Passage this year, which speaks for Libellule in itself. 2013 was a very difficult year in terms of ice. Locals told us that they hadn’t seen similar ice for 20-30 years. According to the ice statistics of some of the most difficult passages (Peel Sound, Bellot Strait, Larsen Sound, Cape Bathurst) this was the most ‘icey’ year since 2005. So it is nice to know that, despite of global warming, mother nature still is mother nature. One year will look completely different from the other. The NW Passage will always remain an adventure. And this is good so. What have we achieved ? – One of the first families. But much more important than these achievements are the many impressions we take home with us. We will keep these impressions our whole life! We have been able to fulfill a dream! Life is very short, so it is nice to be able to seek a challenge and live a dream from time to time. It was certainly a great experience for the whole family, we stuck together throughout the trip, and made this happen together. But we would particularly like to thank our dear French friends Yves and Sylvain, without whom this expedition would not have been possible! And long live the Arctic !!! 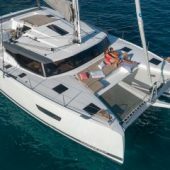 We’ve always known that the SALINA 48 was designed for ocean cruising, with many sails on seas all over the world, we look forward to helping more owners with these voyages: including the Mediterranean, across the Atlantic and around the world through the Cape Horn Passage. We congratulate this family on this monumental achievement!